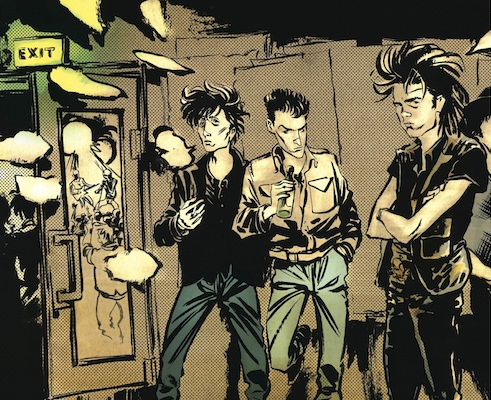 Berliner-by-choice Reinhard Kleist is one of Germany’s hardest working and most successful comic artists and illustrators. His graphic novels portray exceptional figures from politics, sports and pop culture – and have won numerous prizes. Promising young runner Samia Yusuf Omar dreamed of competing at the 2012 Olympic Games in England. But at the beginning of April 2012, she drowned off the coast of Malta fleeing her Somali homeland and the threats of Islamists who condemn athletics for women. 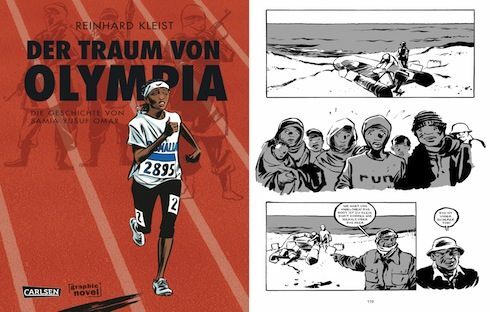 Artist Reinhard Kleist tells Omar’s story in Der Traum von Olympia (Olympic Dreams, 2015) – a moving and unsettling graphic novel in which Kleist portrays the pain and suffering refugees endure on their way to Europe in quite drastic terms. His hope, as he writes in the foreword, is “to maintain our awareness of the fates that hang in the balance behind the media’s side notes on refugee policy, and the human lives behind the abstract numbers”. In 2016, Kleist received the “Jahresluchs” prize for children’s and young adult literature and the Catholic Children’s and Young Adult Book Prize for his novel. Kleist’s work is multifaceted: In addition to highly political topics like the refugee crisis, he also devotes himself to pop culture. 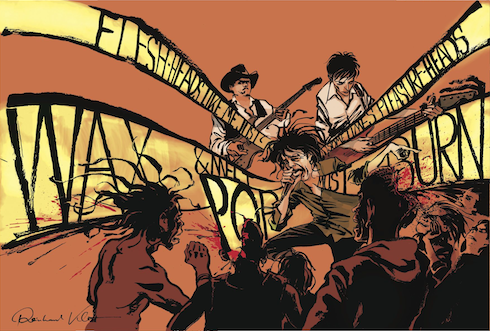 Kleist has drawn comic biographies of singers Johnny Cash and Nick Cave, and both interweave biographical details with fantastic and surrealistic elements. Kleist’s expressive black and white pictures are marked by powerful lines – as if they were tailor-made to portray Nick Cave: his tightly cut suit, his narrow tie, his slicked-back hair. In Nick Cave. Mercy on me (2017), Kleist tells the singer’s story from two perspectives - from the standpoint of friends and companions, and from the standpoint of the protagonists in his lyrics. It covers the most important phases in the singer’s life: how his father read a young Cave to sleep with Dostoyevsky and Shakespeare, how he became the front man of the punk band Birthday Party, and how he finally moved to Berlin and founded The Bad Seeds together with musicians like Blixa Bargeld, lead singer of Einstürzende Neubauten. Kleist delves deep into the reality of the musician’s multi-layered and touching life story, and also steps back from Cave’s biography to hazzard a look into the abyss of his lyrics. 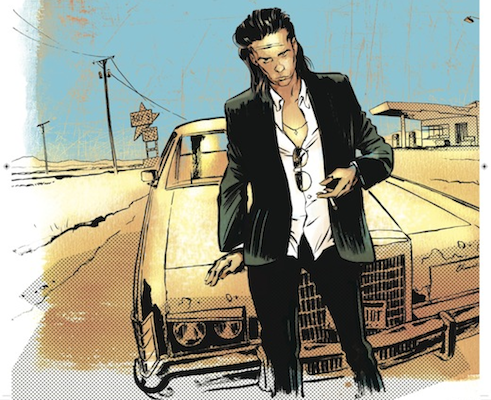 In 2006, Kleist published a comic book biography Cash – I See Darkness(2006). It was the same year that Walk the Line, the film about Johnny Cash, appeared in German cinemas. In the book the Berlin-based illustrator looked at an aspect of the legendary country singer that was of no commercial interest to the Hollywood love story, namely his much darker side. In expressive and cinematically-dynamic pictures, Kleist tells the story of the ups and down of the man in black, of his successes and failures caused by excessive drug and alcohol consumption. He continues his preoccupation with individual personalities in his work Der Boxer. Die wahre Geschichte des Hertzko Haft (i.e. 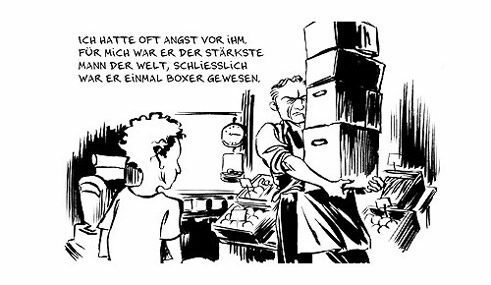 the boxer: the true story of Hertzko Haft / 2012), which was honoured with the 2013 German Children’s Literature Award. 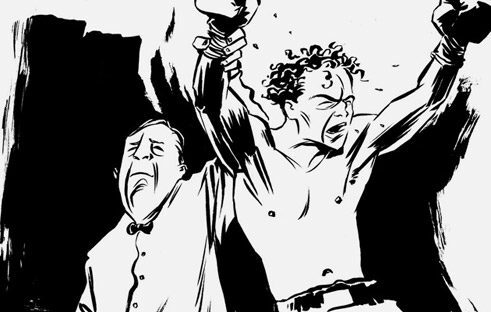 In his pictorial narrative, Kleist depicts the story of the Jewish boxer Hertzko Haft, who escaped the Holocaust only because he fought other fellow inmates to the death in an Auschwitz sub-camp for the entertainment of the National Socialists. 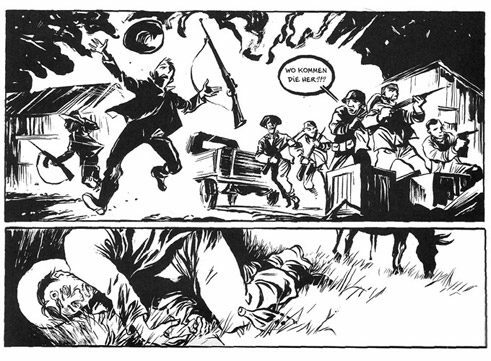 In cooperation with Haft’s son, Kleist transformed the father’s life story into a graphic narrative that subtly conveys the horror and develops a pull that hardly anyone can resist. The book, which first appeared as a serial in the German daily newspaper Frankfurter Allgemeinen Zeitung, has now been translated into several languages and has had great appeal abroad on account of its theme and format. For his debut, Lovecraft(1994), which he devised and created during his art and design course Reinhard Kleist received the coveted Max-und-Moritz prize at the Erlangen Comic Salon. The jury was immediately gripped by the fantastic, sinister story about a comic artist who is confronted by supernatural events during his work on the biography of the American horror writer. 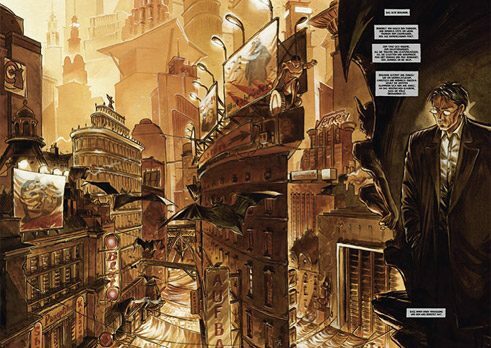 The polished page architecture with which Kleist stages his artistic comic images did the rest. It appeared that a new star of the German comic scene had been born. Yet, whilst critics and comic experts gave his work the highest praise, his publications would prove to be too unwieldy and unconventional for a lot of potential purchasers. Things have changed fundamentally in the meantime. Kleist drew inspiration for both the contents and the expressive formal design of his comics in the works of H. P. Lovecraft, Clive Barker and Oscar Wilde. He amalgamated Wilde’s The Picture of Dorian Gray and Barker’s Human Remains for his next album Dorian(1996). In his Das Grauen im Gemäuer(i.e. The Grey in the Walls / 2002), he uses unparalleled black and white images to interpret short stories by Lovecraft. Kleist prefers to set his comical and morbid tales in apocalyptic urban environments. The backdrops to his Berlinoir series (created with Tobias O. Meissner) are based on scenes and locations from the films Metropolis, The Cabinet of Dr. Caligari, The Third Man and Blade Runner. In this trilogy, Kleist projects a dark future vision of the city of Berlin, which is ruled by a bloodthirsty legion of vampires. Only a few rebels dare to resist the excesses of the tyrants and they lead a hopeless underground partisan war. 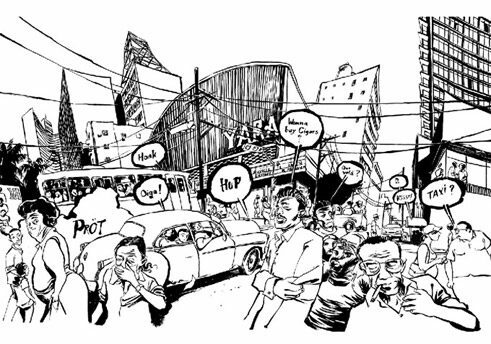 Berlinoir is a pièce de résistance of the fantasy comic and at the same time a biting political parable on existing and past social events in the metropolis. From individual epochs of past centuries, Kleist generates a bewildering, retro-futuristic patchwork of contemporary history, in which aesthetic and political references positively abound, from the socialist workers’ movement, to fascism, DDR socialism and capitalism. Kleist’s utopian comics are a reaction to real events and draw a complex and revealing portrait of society. 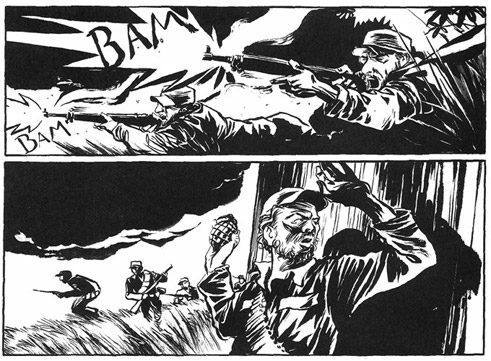 In addition to depicting historical figures and events in his comics, Kleist also illustrates his own impressions and experiences. In March 2008, he visited Cuba for four weeks to get to know the country and its people first-hand. In sketches, illustrative paintings and comic episodes, Kleist was able to capture the voices of the streets of Havana as well as the living conditions of the people. Havanna – eine kubanische Reise (i.e. 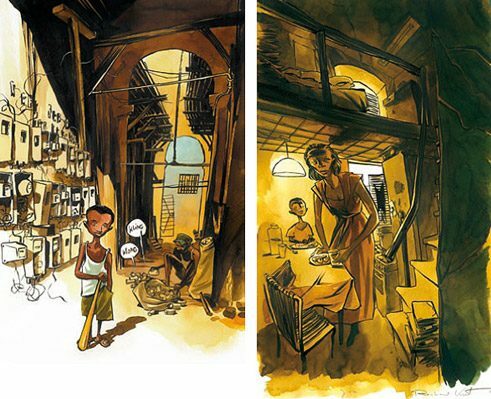 Havana – a Cuban excursion / 2008) is a biographical travelogue, shaped by the illustrator’s subjective impressions. Kleist himself is quite clear that he only gained a superficial insight into the culture and society of Cuba. His drawings are not entirely free of clichés, but since his return he has changed his opinion about Cuba, in particular with reference to the social situation in Germany.